With the economic situation we’re in, all of us are watching where our dollars are spent. When it comes to care for our pets, we can budget for the preventive medicine, the maintenance of veterinary medical care. But when an emergency happens, or when an unforeseen disease/condition shows up, such as diabetes or hyperthyroidism, we’re not always prepared for the costs that will be involved. Pet insurance is a way to prepare for these potential costs. Keep in mind that pet insurance works much more like car insurance than human health insurance. The human health insurance field is considered by many to be a complete nightmare, where there is endless paperwork and one never really knows how much anything costs because of negotiated rates and co-pays. There is significantly less confusion with pet insurance, and that’s why the better comparison is to auto insurance. What happens when you’re in an accident and your car needs repaired? You visit a local collision shop, get a written or verbal estimate, and proceed with the job. You then pay for the service(s), and submit the receipt as a claim to your insurance provider who reimburses you. Different plans include different deductibles, and these would be subtracted from your reimbursement. (Thanks, BRAC, for the great analogy!) Pet insurance works in a very similar way. 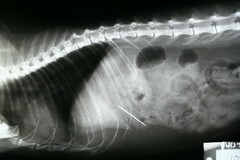 *The cat that swallowed a sewing needle and thread (we saw this case in 12/09) cost the owner, from radiographs to surgery to antibiotics, over $800. *The dog with a cruciate ligament injury that required surgery to correct the painful instability (seen often) along with future anti-inflammatory therapy for secondary arthritis had both immediate need, as well as long-term need. Combined, the costs can reach several-thousand dollars. The companies with which we have the most experience are Veterinary Pet Insurance (VPI), Trupanion, Embrace (a local company with offices in Beachwood, OH) and Petplan. We’re not interested in endorsing any particular company; only you can choose the company and the coverage plan that is right for you and your pet. If you visit PetInsuranceReview.com, you can find many reviews and opinions in one place, as well as links to additional insurance providers. Don’t wait until your pet has aged or taken on what might be considered pre-existing conditions. Purchase pet insurance while your pet is young and the premiums will be at their lowest. The result? You’ll be able to make the best choice for the best care when your pet needs it most. Broken Tooth: What's the Solution? Comment on "Look Into Pet Insurance"